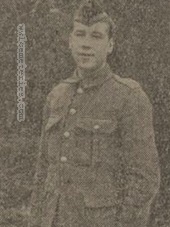 G/2386 William Frederick Manton, 12th Bn., Middlesex Regiment, 14th July 1916. 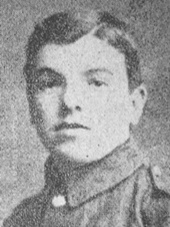 Pier and Face 12 D and 13 B.
William was killed in action on the 14th of July 1916 for the Battle of Trones wood. In civilian life he was a wireman on the trams and came from Peckham London. 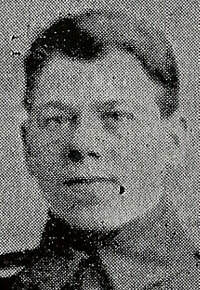 ​2326 Rifleman John Joseph Meehan, 1st Bn. Royal Irish Rifles, 1st July 1916, aged 20. Pier and Face 15 A and 15 B. Son of Charles Henry and Catherine Meehan, of 17, King's Avenue, Ballybough Rd., Dublin. 18th November 1916, aged 29. 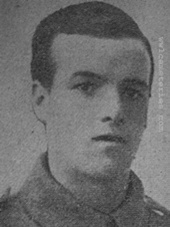 15th July 1916, aged 25. Son of Mr. and Mrs. William Malcolm, of 46, Coach Rd., Wick, Caithness. He was born in Wick, Caithness on 16th March 1891. 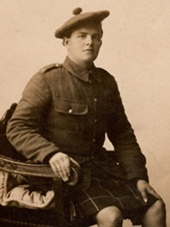 John Malcolm Enlisted at Wick, Caithness and went to France on 10th May 1915. My father, Alexander John Malcom Mackay MBE, DFC, was his nephew and was named after him. Picture courtesy of Jane Mickelborough, great niece. 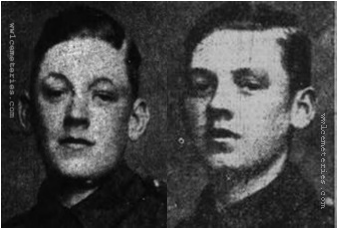 Pier and Face 15 B and 15 C.
17th July 1916, aged 20. Son of Linney Marsh who later married Thomas Yates. At the age of 14 George William was working as a brickyard labourer at the Bentink Colliery, Kirkby-in-Ashfield but prior to enlistment he worked as a miner at the Silverhill Colliery. After early training near home, the units concentrated in June 1915 in North Yorkshire. Divisional HQ was at Masham and units were at Roomer Common, Marfield, Fearby and Masham. In August 1915 the Division moved to Salisbury Plain, HQ being set up at Marlborough. Over the next few weeks moves were made to Chiseldon and Cholderton. In late 1915 orders were received to kit for a move to Egypt but this was soon rescinded and the battalions were ordered to France. On the 16th July 1916 the battalion relieved the 6th Northamptonshire Regiment in trenches S.E. of Trones Wood to immediately west on Maltz Horn Farm. The 16th Cheshires were on their left flank and the 7th Buffs on their right flank. 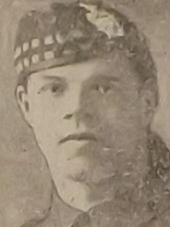 7th July 1916, aged 23. Son of Thomas and Linda Yates, of 6, Spring Hill, Sutton-in-Ashfield, Nottingham. His brother William also fell. 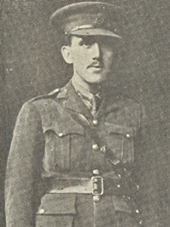 Robert Henry Marsh (Bob) was born on 22nd December 1894 at 9 Lord Street, Sutton-in-Ashfield, the son of Linney Marsh. 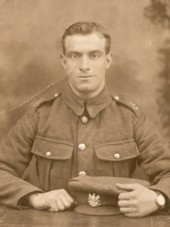 Bob was working as a brickyard labourer, at the Bentink Colliery before enlisting with the Sherwood Foresters during late 1914. After initial training close to home they moved to Wool then to West Lulworth in October and back to Wool in December. At the end of April 1915 the battalion packed up and said goodbye to the peace of Lulworth Cove. They marched for five days, bivouacking over night at Bovington, Cranborough Park (a wood near Ringwood) and in fields around Totton, Southampton. Their destination, Flowerdown Camp near Winchester, was reached on 30th May 1915 where they did their final training. The Division had originally been chosen to remain in Britain to meet a possible German invasion of the east coast but there was a sudden change of plan at the War Office and orders were received to embark for France to join the British Expeditionary Forces. 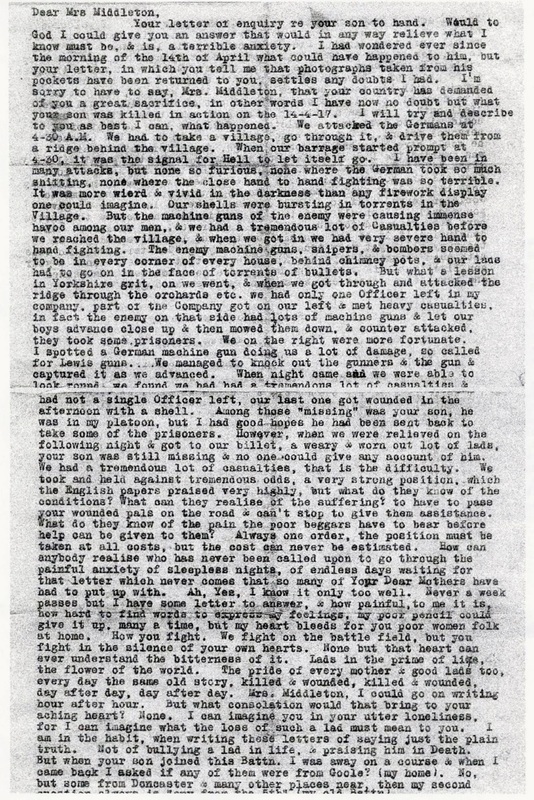 Robert was in the thick of fighting at Ypres, The Ypres Salient and around Contalmaison. 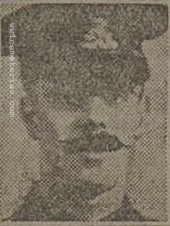 The Sherwood Foresters Roll records that he was ‘killed in action when in the attack on Quadrangle Support near Contalmaison, France’ on 7th July 1916. He was just 21 years old. Pier and Face 5 D and 12 B.
Pier and Face 10 A. Lived at 8 Ardwick Street, Burnley, Lancashire. 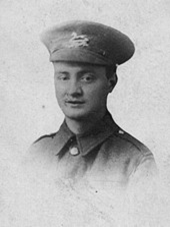 8th November 1916, aged 25. Lived at 25 Wynotham Street, Burnley, Lancashire. 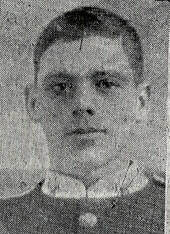 Son of Alexander and Janet McNab, of 75, Barden Lane, Burnley. 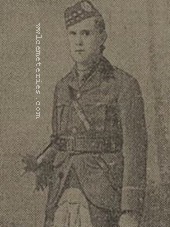 William Rollo Meldrum M. M.
He was born Airlie, Forfar on the 1st October 1883, Son of David and Margaret (Smith) Meldrum. 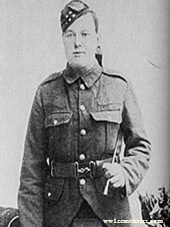 31st October 1916, aged 20. Pier and Face 11C and 12A. Son of Mr. T. M. Millar, of "Glenvarloch," 6, Argyle St., Dundee. 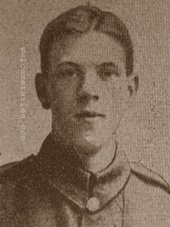 1st July 1916, aged 17. Son of Thomas and Clara Mitchell, of 12, Mason St., Burnley. Article from the Burnley Express Newspaper 1916.
" 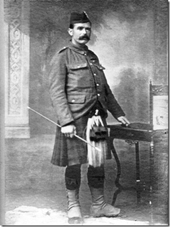 You must know by know that Tommy left for France to join the 1st Battalion. I must say he was a smart lad, and wanted so much to go, always saying it was about time he was out. Now he has gone, and one wishes him luck. He should have been made a full Corporal in a few weeks. There is a future for him I feel quite convinced". 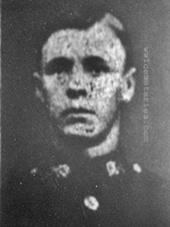 Lance Corporal Mitchell was a member of the Nelson St. John's Boy Scouts, holding the position of Patrol Leader, and having won most of the badges offered by the scouts. He attended the St. Thomas Mission in Burnley. He stood 5ft 8 and a half inches in height. 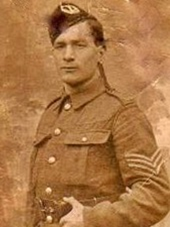 His Father served twelve years with the 3rd East Lancashire Regiment. Pier and Face 4 A and 4 D.
Husband of Isabella Moffatt, of 35, Denton Crescent, Denton Holme, Carlisle. 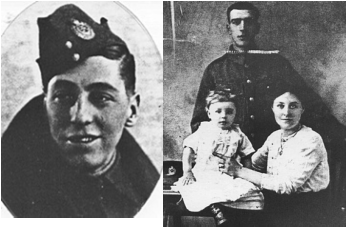 1st July 1916, aged 31. Husband of Elizabeth Alice Moran, of 45, Craven St., Hightown, Manchester. Lived at 102 Anne Street, Burnley, Lancashire. Son of Edward and Anne Murphy, of 62, Olympia St., Burnley.